You are here: Home / Food! 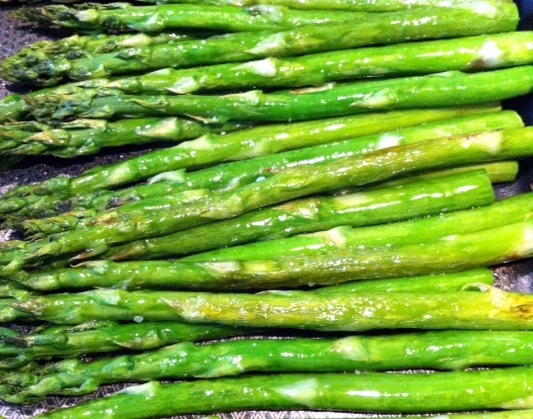 / Around Alison's table / Quick, it’s asparagus time! The prices have just gone down compared to a couple of weeks ago, so it is time to make the most of the short asparagus season. So, green or white? To be honest it wasn’t something we ate a great deal of as a child, but I do love roasted green asparagus shoots. And only recently have I discovered a lovely asparagus salad with the white ones, thanks to the Wednesday Chef Luisa Weiss. She has a recipe in her book The Berlin Kitchen where she steams white asparagus and then adds her vinaigrette, full of fresh chopped herbs, to the asparagus whilst it is still hot and leaves it to infuse for a couple of hours. Converted me! What is the actual difference? Not much, the white stems are slightly milder in flavour and a bit more tender than the green variety and both can be used interchangeably in recipes. It is considered difficult to pair with wine as it contains methyl mercaptan, a sulphur compound, which tends to give wine a vegetal or metallic taste, so it is best paired with cool climate wines with pronounced herbal flavours to counteract this. White asparagus is grown by creating mounds of soil around the growing spears, hiding them from the light and resulting in their pale, blanched appearance. 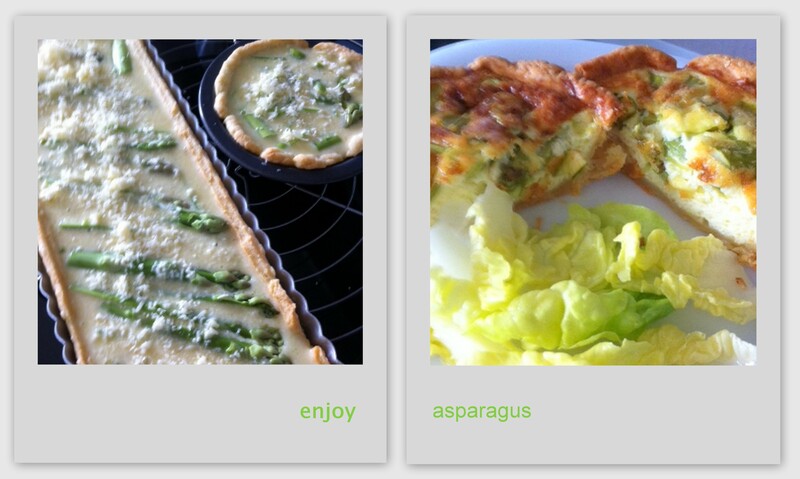 Here is a recipe for a delicious asparagus and cheese tart with green asparagus. It is worth making the cheese pastry as it really adds to the flavour rather than using plain shortcrust bought from the shop. It is easy to handle as well, so a good pastry to start with if you are not used to making pastry. Put the flour in a bowl, add the butter and rub in with your fingertips until it resembles breadcrumbs. Add the grated cheese and mix. Add 3tbsp cold water and mix until the pastry forms a ball, wrap in clingfilm and chill for 5 mins. Butter a 20 x 6cm deep loose bottom tart tin, or a 35 x 12cm rectangular tart tin. Heat the oven to 180°C/160°C fan. Lightly dust the work surface with flour, roll out the pastry to fit the tin and line the tin. Chill in the freezer for 20mins, then line the pastry case with baking paper, fill with beans and cook for 15 mins. Remove the beans and baking paper, then return the pastry case to the oven for a further 10 mins. Crack the eggs into a jug and whisk, add the milk and half the cheese and whisk again. 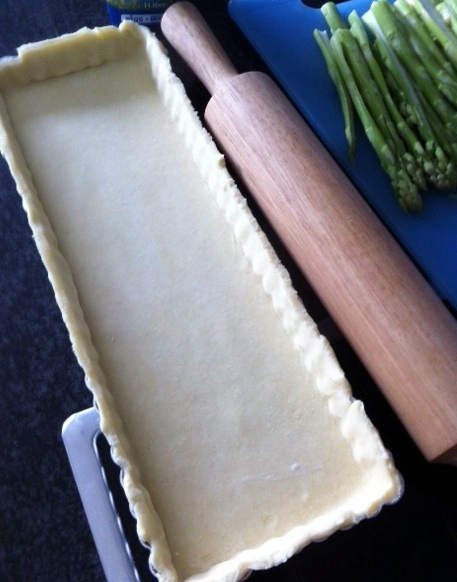 Sprinkle half the grated cheese over the pastry case, top with the asparagus, egg mix and remaining cheese (if using a rectangular tin you may not need all the mixture, so I used the spare pastry to make individual tarts). Bake in the lower half of the oven for 30-35 mins or until the egg mix is set.